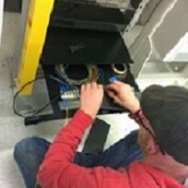 Waveguide Networks, Inc. specializes in fiber optic splicing and testing services and provides these services on-site year-round throughout the Pacific Northwest. Including Washington, Oregon, Idaho, and Alaska. From long-haul networks to metro networks we can quickly and efficiently get your network installed and operating within budget and time frame. Fiber Optic Splicing – (Fusion Splicing). Emergency Restoration – In-Service Hot Cuts. Client Class – Emergency Restoration. Our job performance is 110% and we “go that extra mile” for our customers on all jobs we do. Our client’s best interest is always our #1 priority. For cable purchase, plus cable splicing and testing, one contract puts you on your way to complete fiber optic network services – call us! We are fiber optics experts! We are known for our reasonably priced, high quality service. Provide superior performance on your network. Our technicians are highly skilled in all aspects of fusion splicing, testing in-service “hot” cuts, emergency restoration, etc. Complete fiber optic splicing (Fusion Splicing). Complete testing services, such as end to end, reel testing, and splice loss testing, ORL, power meter/laser source testing and WDM testing. Utilize state-of-the-art test equipment to offer you a variety of specialized fiber optic testing required to maintain top quality services. Maintenance agreements which include our data archiving program. Emergency Restoration Class for our employees.